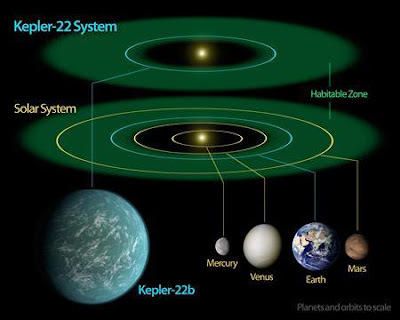 Irtiqa: When can we go to Kepler 22b? Yes. Astronomers have the first confirmed detection of an earth-like planet located in the star's habitable zone - the distance from the star where water can exist in liquid form. It is also called the Goldilocks zone (The Red Riding Zone is where the planet gets eaten by a wolf pretending to be the planet's grandmother). The discovery is amazing, if not really surprising. There are just too many planets out there, and we are bound to find planets in places that match conditions of the Earth. And life is also likely to be quite common. Life that can build telescopes? Don't know. So what do we know about this planet? It is called Kepler 22b. This is the sexiest name that astronomers could come up with (actually, it is because it is discovered by Kepler telescope). It is located about 600 light years away - just far enough that we can't start thinking about packing our bags for a trip. At least, not yet. It is about 2.4 times the radius of the Earth. We don't know its composition for sure, but there is a good chance that it is a rocky planet. And perhaps most importantly, your birthdays would come every 290 days (woo hoo!). Is there life there? We don't know. This planet was detected when it passed in front of its star, dimming the light of the parent star a bit. We do not have an image of the planet. When we do - and it may take years - then we can potentially analyze the composition of its atmosphere. The presence of oxygen in the atmosphere will be a good indicator for life, as oxygen in our own atmosphere is a by-product of life itself. If you are interested, I had a chance to talk about Kepler 22b as well as the idea that we may all be Martians on the Bill Newman show yesterday morning. The segment is called Musings on our insanely huge universe and you can download it here (the segment about Kepler 22b is the last 15 minutes of the show). We also had a discussion of dark matter the month before, and you can find that episode here (again the last 15 minutes of the show). I have been browsing for last couple of days to find out answers for the questions so far with little success. May be you can help. It is transit photometry and the "silhouette against stellar disc" is using a bit of artistic freedom in saying the same thing. But you are right, we can't take the the disc of the star - not yet. The distance is slightly less than the orbit of the Earth (it takes about 290 days to go around its Sun - or about 0.85 Astronomical Unit) - so no risk of tidal locking with its parent star. Sorry, Salman, but I think we should curb the excitement a bit on this one. Sure, this is a very interesting candidate (possibly for liquid water, and -- small chance -- but potentially even for life), but we don't quite have "the first confirmed detection of an earth-like planet". What we have is a planet that is located in a habitable zone, yes, but we don't know its mass (it could be somewhere between 10 and 35 times the mass of the Earth) and thus its composition, and so we don't know what kind of surface and atmosphere it will have, i.e. whether it's a "small Neptune" (i.e. mostly gaseous) or a "big earth". We also have no clue about the inclination of its axis and about its rotation period. It could be icy, might have a liquid ocean, and that would be quite nice, though not unheard of (hello Europa), or it could have a big mostly hydrogen atmosphere; it's just too early to speculate. The public needs to be told that this is how science progresses: by steps of improved cases/candidates, not by suddenly winning the jackpot. And last but not least, we need to deemphasize the search for a "twin earth"; the universe is huge and wonderfully diverse, and we will more likely find something interesting in a somewhat different candidate than by just getting obsessed with finding "a twin earth" and seeing everything as "an earth-like planet". "The public needs to be told that this is how science progresses: by steps of improved cases/candidates, not by suddenly winning the jackpot. " Oh - but this announcement (or even calling it Earth-like) does not give the impression of winning a jackpot. In fact it may do the opposite - and points to the inevitability of finding planets that are closer and closer to the Earth in characteristics. So for example, 15 years ago, we had no confirmed detection of planets. Now that is not news. Up until a few years ago, we had no planets much smaller than Jupiter. Now that is not news. Now we have a confirmed detection (there are a lot more candidates) of a planet within the size range of the Earth (about 2 times is pretty close) AND it is in the habitable zone. I think it warrants excitement! Of course, the excitement will be higher when (and not if) we detect a rocky planet, about the mass of the Earth, and in the habitable zone. I think this incremental level of excitement is justified and it brings such news items to the forefront. As far as the question of focusing on excitement related only to earth-like planets, well, that has to do with the possibility of finding life elsewhere and public (and scientific/philosophical) interest regarding that. On the other hand, some news stories also focus on planets that are completely strange and unlike the Earth. That is another way of framing the news story. So compared to the use of problematic metaphors like "The God Particle" for publicity purposes (and you have also criticized the use of such metaphors), I think the excitement around Kepler 22b is far more justified. While most of the techniques of detecting exoplanets are good only if the planetary system's orbital plane is edge on from our perspective, like doppler or transit studies, the majority of exoplanet systems as I understand will be near perpendicular to or at an angle to us. Are there any techniques under consideration to detect systems with such orientations? I have been working on ways to physically block or eclipse the stellar disc to make it possible to actually 'view' the exoplanets in vivo, but cannot reach a conculsion as to how it would be possible. The atmospheric turbulence and scattering has just been too much to handle, and I don't have means to even think of developing the adaptive optics or something similar in near future at least. Any bright ideas doc? 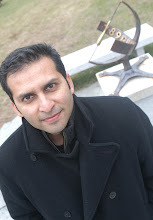 Salman: I think calling this planet “earth-like” (as you did) is jumping the gun. All we know is that it has a diameter 2.4 times that of Earth (14 times its volume); we don’t know its mass, its rotation rate, the inclination of its axis, and anything about its atmosphere (assuming it has one). You didn’t use this term, but google up Kepler 22b with “Earth twin” and see how many pages you get. People are going gaga over this. This is the first confirmed planet in the habitable zone, and it should be presented as such, and nothing more. And indeed, it is a small incremental step forward toward the major discovery of an earth-like planet, with all the great characteristics. I too am fully convinced that this will be coming sooner than later. Finding life will be a big step beyond that. Now, everyone can go back and look up the planets that were recently found just beyond the habitable zone, or just a bit too big, or probably within the habitable zone but just unconfirmed. So Kepler 22b is the first confirmed one, a step forward, and it should only be presented as such. Yes, I have been consistent in criticizing undue metaphors like “the God particle”, but that one would be a jackpot, so I can understand why the proponents of the Higgs boson would use such words to refer to it. But astronomers should at least reserve such excitement until a big discovery is made. This is not such a big one. Nidhal, I think we agree more on this than we disagree. Using "Earth-Twin" is indeed misleading (and I did not use it). I think our disagreement stems from the term "Earth-like" and what should be apt level of excitement. I use it to mean smaller planets in the size-range of the Earth (this will probably qualify as a "Super-Earth"). Just like astronomers have been detecting Jupiter-like planets even though they are not exactly Jupiters. One of the goals of Kepler was to detect "Earth-like" planets - and usually it is within an order of magnitude of Earth's size. Should we consider Kepler 22b - which is 2.4 times its radius - Earth-like? I do - but I can also see objections to it (it is between the size of Neptune and the Earth, and its mass can be as high as 35 Earth masses). Nevertheless, it is certainly not in the class of Jupiters - and I think that is where the excitement stems from and makes the headlines justifiable. As long as we describe the differences, I think we are okay. Soon there will be an announcement of a smaller planet in the habitable zone - and that will also grab the headlines. And we can talk about why that is even cooler news (and with a higher level of excitement)! And then may be a planet with an atmosphere, and so and so forth. Looking back at the last 15 years, I think this does reveal the incremental nature of such scientific discoveries...and not the notion of a jackpot. "Are there any techniques under consideration to detect systems with such orientations?" Anon: Yes, Astrometry (directly measuring precise position of the star and measuring its change) is sensitive to solar systems with perpendicular orientations. You can check out this first astrometric extra-solar detection here and also check out this short paper (pdf) on the potential of finding earth-size (!) planets using this technique. when will the kepler tetascope reach any of the it planet,s or will nasa build another probe to voyage there antime soon..